Linnaeus's 1758 Systema Naturae, the starting point of zoological nomenclature, described 118 species of reptiles, including 74 snakes (not counting the limbless lizards and amphibians he included in the same group). 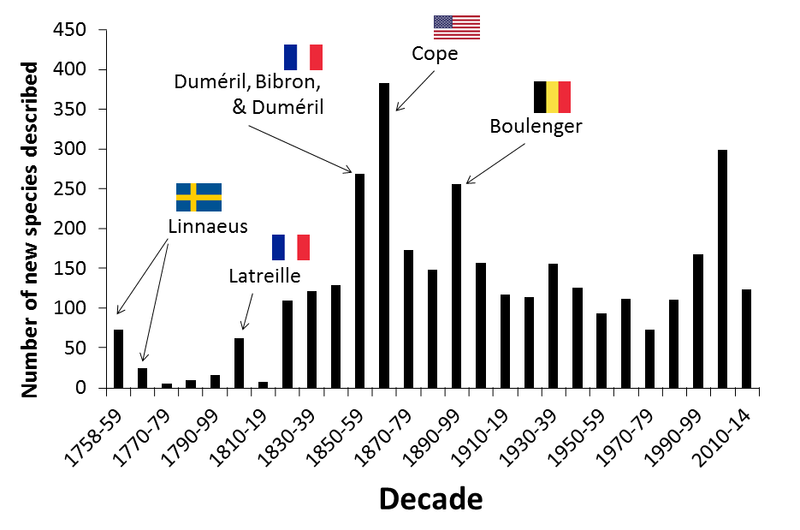 It took over 100 years for the number of described species of snakes to reach 1000, an event that probably passed without much notice amid the American Civil War. 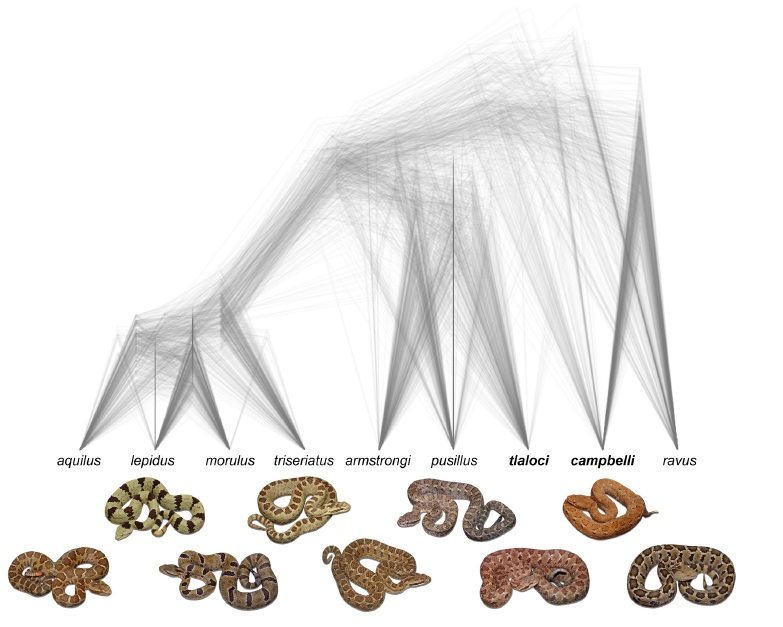 Since that time, new snake species descriptions have been added at the rate of about 15 a year, although molecular taxonomy has increased this pace over the last few decades. The trends for snakes and for reptiles as a whole have been similar, and on July 9th, 2014, a team of American, German, Lao, and Vietnamese scientists described a new species of gecko from Laos, which the journal Herpetological Review reported as the 10,000th reptile species. Needless to say, I was excited, but I was also extremely disappointed because I had been so hoping that it would be a snake! Rather than admit defeat and scrap this planned post, I emailed Peter Uetz at The Reptile Database, an incredible resource that I've praised before, to confirm that this gecko was indeed #10,000. As usual for taxonomy and as I should have suspected, the reality was a bit more complicated. Although Cyrtodactylus vilaphongi was the 10,000th reptile species for a while, the order and position of entries in The Reptile Database is constantly changing. Although new species get added to the end of the list, it's common for two or more existing species to get synonymized or merged, which moves the position of all subsequent species up. Furthermore, sometimes species that were described long ago and subsequently synonymized are revalidated, leading to 'new' species that aren't really new in the sense that they have existed before. Finally, often existing species get split up, leading to additions that aren't as dramatic as legitimate new discoveries. This last complication is on the rise now that molecular systematics has enabled us to describe the cryptic diversity of some lineages, which are not all that morphologically distinct but may contain considerable genetic diversity. At the time of my email to Peter last month, C. vilaphongi was the 9988th species, and (happily), a new snake, Siphlophis ayauma, was #10,000. Although this has probably changed again by now, I'm going to operate under the assumption that, since we can't really say with certainty that any particular species was #10,000, if it was a snake, it was probably one of the 11 brand new snake species that have been described so far this year. You can read about many of these on the blog 'Species New to Science', but I'm going to highlight them in a little more detail here. 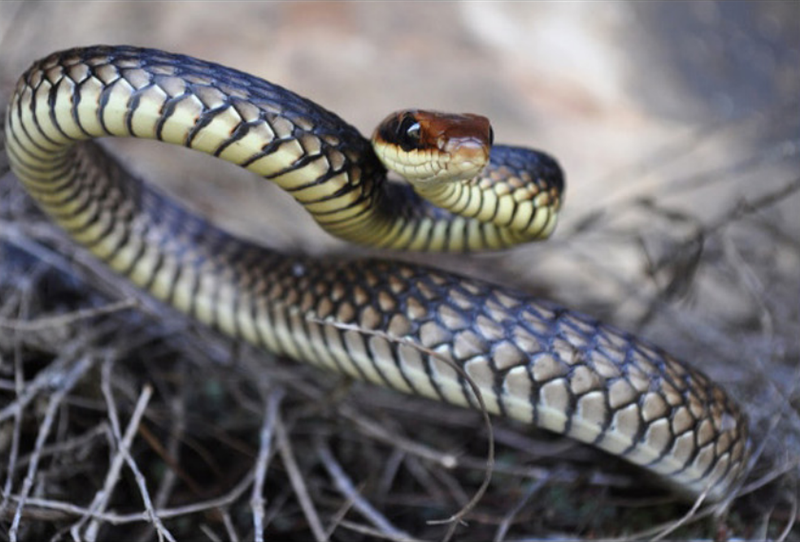 The first new snake described this year, Rhabdophis guangdongensis, was collected by a team of Chinese herpetologists in Guangdong Province in 2008. The reason it wasn't described until the February 20th issue of the journal Zootaxa is because, as is often the case, it takes a couple of years to compare both the anatomy and the DNA of a suspected new species to reference specimens of known similar species and establish that the species really is new. In the past, particularly prior to the internet, the difficulty of doing this was a huge problem, resulting in close to half of all 'new' species later being invalidated as duplicates. 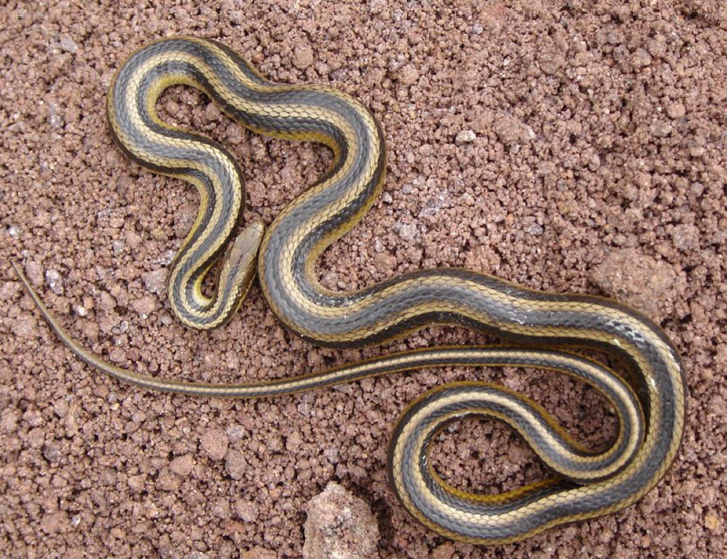 The genus Rhabdophis is distributed in southern and eastern Asia, and this is the 21st species. It's an extremely interesting genus from a chemical ecology perspective, because at least one species sequesters defensive chemicals from its prey and provisions them to its young (which I wrote about for Scientific American shortly after I started this blog). A recent paper by Yosuke Kojima and Akira Mori on the Japanese species R. tigrinus showed that females periodically leave wetlands for forest streams where they forage on toads, likely to obtain the necessary toxins for provisioning their offspring. The new species also has specialized structures, known as nuchal glands, on the back of its neck, so presumably it stores bufotoxins there as well, although this has yet to be verified. 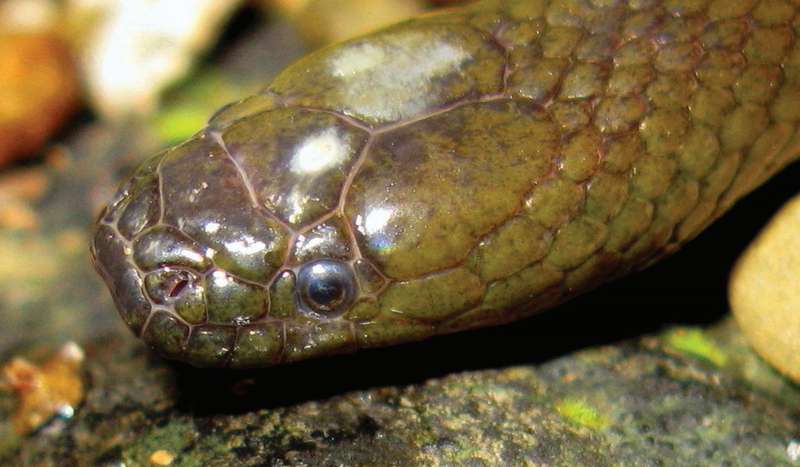 On March 3rd, a team of French, German, and Vietnamese scientists published a description of Opisthotropis durandi, a highly aquatic snake collected from the base of a waterfall in northern Laos. This is the seventh species of Opisthotropis described in the past 20 years, and the first from Laos (although other species are likely to occur there based on their occurrence in surrounding countries). Like the new Rhabdophis, it is also the 21st species in its genus. It is important to realize that, like most species new to science, this snake was already known by local people. It is called Ngou Koung or Ngou Kung, meaning “shrimp snake”, suggesting that it may eat shrimp. The pools at the base of the waterfall where the first specimen was found contained many small shrimp. Harvey Bassler, a petroleum geologist, explored many of the Amazon's upper tributaries for his work during the 1920s and 30s, during which time he collected over 4,200 snakes on the side. Bassler deposited his magnificent collection in the American Museum of Natural History in 1934, and on March 6th this year Charles Myers and Samuel McDowell published a monograph in the Bulletin of the American Museum of Natural History describing a species of snake collected by Bassler in 1927, for which they erected a new genus, Eutrachelophis (‘beautiful-necked snakes’’). They also placed in this genus a species originally described by Boulenger in 1905, Rhadinaea steinbachi, which they renamed Eutrachelophis steinbachi. Although the two species (and a third, yet undescribed) have very similar skeletons, muscles, glands, viscera, and markings, they probably would have been placed in separate genera had they been described in the 19th or early 20th century because their hemipenes are so different. E. steinbachi has long but relatively normal-looking hemipenes, whereas E. bassleri has extremely unusual heimpenes tipped with a dome-like structure so strange (at least within the world of snake hemipenes) that the authors wrote "we have seen nothing quite like [it]." Hemipenes were traditionally considered one of the most taxonomically-important structures in snakes1 because they were considered to be evolutionarily neutral (that is, unlikely to change in response to selection), but a growing awareness that evolution by both natural and especially sexual selection can influence the morphology of male genitalia led these authors to recognize that these two snakes were in fact close relatives. Although we await molecular confirmation, the authors propose a mechanism by which differential expression of Hox genes2 could cause such a rapid divergence in hemipenal morphology between two sister species. On January 12th, 2008, a group of American and Ecuadorian herpetologists stopped for lunch at a grilled-chicken restaurant in Paute, Azuay province, Ecuador. They noticed a peculiar sun-faded snake on display in a jar of alcohol that they couldn't quite put a name to. Following negotiation with the restaurant owner, the specimen was acquired and determined to belong to the genus Siphlophis, but could not be identified to any known species. A few months later, another specimen was found alive about 100 miles to the north, and two more were discovered in 2011 about the same distance to the south. A fifth individual is now recognized to have been hiding out unnoticed in the collection of the Museo de Zoología, Pontificia Universidad Católica del Ecuador. Because of its red-banded head and its occurrence in the mountains near cold (achachay) streams, the new species was named Siphlophis ayauma after the Kichwa spirit Aya Uma, a good spirit devil who derives strength from nature, particularly from cold mountain pacchas (cascades) and is represented in Kichwa folklore as having a colorful red-banded head. 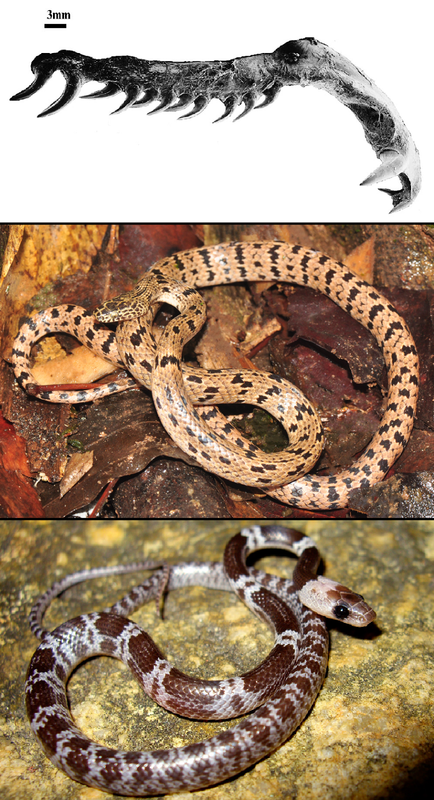 This is the seventh species in the genus, the third species known from Ecuador, and the first new species of Siphlophis since 1940. 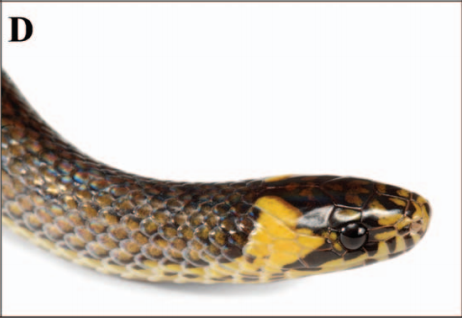 The results are published in the April 1st issue of the South American Journal of Herpetology. In a montane grassland high in the Andes Mountains of southern Ecuador, another genus gained its 21st species this year: Philodryas amaru. Known to the Ecuadorian and Brazilian authors since 2005, a small population of these striped racers was formally described in Zootaxa on April 4th this year. The new species resembles Philodryas simonsii in color pattern, but differs noticeably in its hemipenis morphology. "Amaru" means "snake" in Kichwa, and is also the name of a snake deity who influences water and the economy. This diurnal snake lays clutches of 9-13 eggs underground in galleries and under decaying logs, and probably eats frogs and lizards. It is a close relative of the Galapagos racers that I've written about before. Night adders (genus Causus) are a small and unusual group of vipers found in sub-Saharan Africa. They were once thought to be the most primitive vipers and were placed in their own subfamily, but they are now grouped with the viperines even though they have a plethora of unusual features: platelike head scales, round pupils, a different hinge mechanism for their erectile fangs, incomplete fang canal closure, and elongate venom glands in most species. On April 25th of this year, Don Broadley3 described the first new species of Causus since 1905. He named it Causus rasmusseni after the late Jens Rasmussen, a Dutch expert on African snakes who died in 2005. This species is found only in the watershed between the Congo and Zambezi basins, where it co-occurs with three other species of Causus. Broadley first became aware that there might be a new species of night adder in this region in 1991, when he noticed pale gray C. rhombetaus from northwestern Zambia with black markings and low ventral scale counts. In 2013, someone sent him a picture of one eating a toad (another unusual adaptation that night adders share with several other snakes), which prompted him to look again at the unusual specimens and describe them as a new species. Few molecular data are available for Causus, so this diagnosis is based on morphology alone. 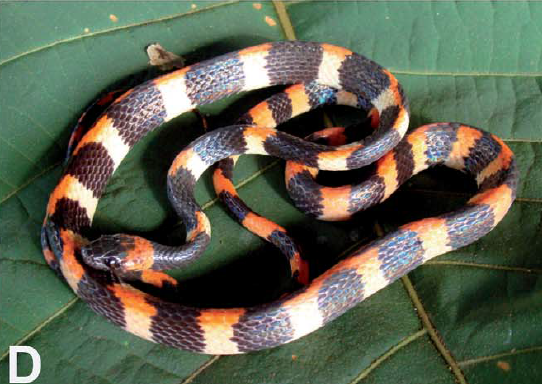 Brazil is graced with nearly 400 species of snakes, including 30 of the world's ~80 species of coralsnakes. The morphology of coralsnakes is highly variable, and there are many misidentified specimens in museum collections, so it is often difficult to recognize new species. 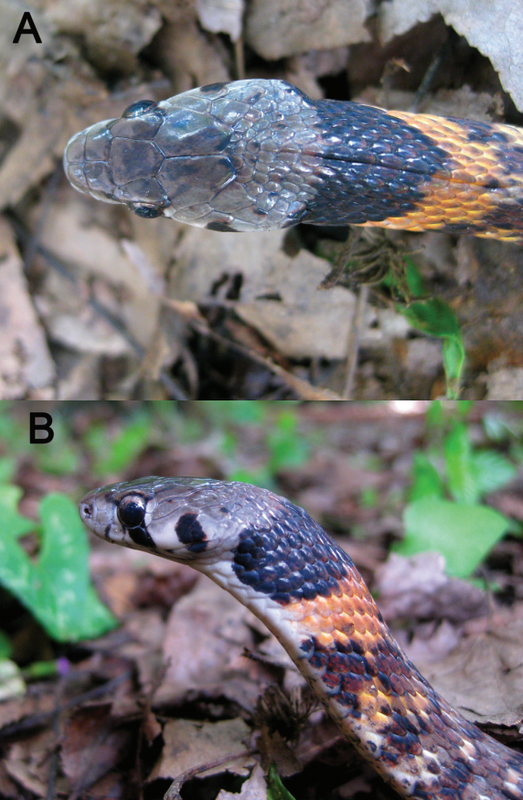 A group of Brazilian herpetologists working on the tri-colored coralsnakes from the endangered northeastern coastal forests discovered a new species, which they described in the June 5th issue of Zootaxa (if any of these dates are your birthday, then you share a birthday with that of a new species of snake!). Wolfsnakes (genus Lycodon) are named for their fearsome-looking fang-like anterior maxillary teeth. Unlike the true fangs of vipers, elapids, and atractaspidids, wolfsnake teeth are not grooved or hollow and they have no venom. Instead, their strongly arched upper jaw helps them feed on skinks, whose hard, cylindrical bodies fit snugly into their diastema, or the gap between their anterior and posterior teeth. The wolf-like anterior teeth keep the skink from being squeezed out of the mouth, while the posterior teeth slice through the skink's cycloid scales. At least 16 of the nearly 60 species of Lycodon have been described since the 1990s, including two this June: Lycodon zoosvictoriae from the Cardamom Mountains of southwestern Cambodia, and L. cavernicolus from a limestone cave in peninsular Malaysia. The latter is a cave-adapted species, both specimens of which were found climbing several feet above the cave floor, in total darkness. 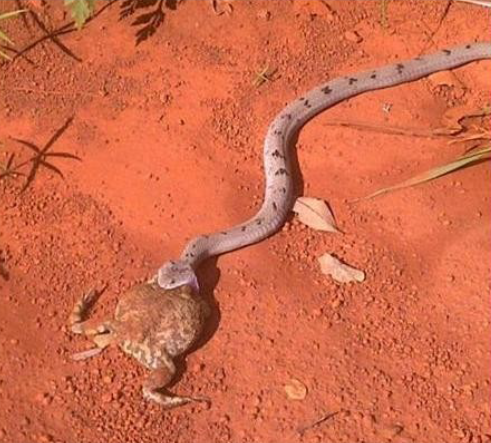 It's likely that they eat a cave-adapted gecko. Many of the caves in this region are in immediate danger of being quarried for cement before their endemic fauna and flora can be fully documented. Both of these species were also described in Zootaxa, which is a relatively new journal dedicated almost exclusively to rapid publication of new species descriptions, with the stated goal of aiding conservation efforts by circumventing the lengthy delays normally associated with publication of new science. 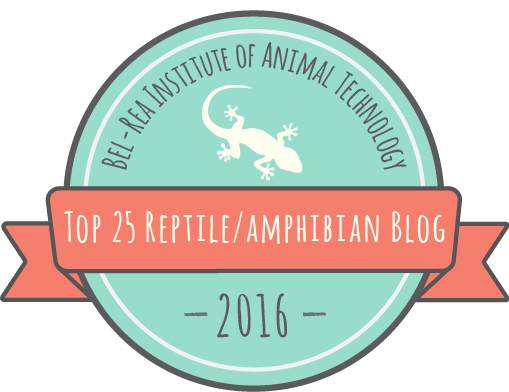 Since its inception in 2001, Zootaxa has become a daily journal that has published nearly one quarter of all new animal taxa and nomenclatural acts in the last five years, including over 400 new species of reptiles and the 7000th species of amphibian. Just three days before the new gecko, a team of scientists from Mexico, the USA, and Canada published a genetic analysis of the Crotalus triseriatus species group, which contains small montane rattlesnakes found in Mexico and the southwestern USA. Although five species were historically recognized within the group, an analysis of seven nuclear genes revealed that there are at least nine species, including two that were previously recognized as subspecies and two more that have not heretofore been formally recognized. The paper described the two new species: Crotalus tlaloci, named for Tláloc, the Aztec god of rain, and Crotalus campbelli, named for herpetologist Jonathan Campbell. The authors of this paper suggest that these rattlesnakes speciated rapidly from a single common ancestor during the uplifting of the Trans-Mexican Volcanic Belt near the end of the Neogene period 2.6 million years ago, which makes sense because they are not very mobile and populations of their common ancestor likely would have become isolated from one another on various "Sky Islands" of suitable habitat during the genesis of this new mountain range. Many species are endemic to the high-altitude pine-oak forests and grasslands of this region, which has become famous as the overwintering grounds of the Monarch Butterfly. In addition to these 15 species, there are a couple of species of snake which were described long ago but that were revalidated recently, including several scolecophidians (Typhlops silus, first described in 1959; Afrotyphlops angeli, first described in 1952; and Letheobia acutirostrata, first described in 1916) and a rattlesnake (Crotalus armstrongi, originally described as a subspecies in 1979 and elevated by the same group that described C. tlaloci and C. campbelli). These are typically announced with less fanfare than the truly new descriptions that I've highlighted above. Although it's actually been the slowest year for new snakes since 19974, we have 15 new snakes this year, bringing snakes to a total of 3,499 (and 2014 isn't over yet!). We could make it to 3,500 snakes in the same year that we hit 10,000 reptiles. I think these milestones in taxonomy emphasize the importance of reptiles and how much we have left to learn about them. I doubt that the pace of new species descriptions will slow down anytime soon, as experts estimate that less than 15% of the species on Earth have yet been described. Increasingly, reptiles, and snakes in particular, are becoming poster-children for biodiversity and conservation, a welcome change from their history of being overlooked and maligned. Soon, we will have high-quality global range maps for all species of reptiles, an achievement reached some time ago by amphibians, mammals, and birds, which will enable their incorporation into global assessments of vertebrate diversity and conservation planning. It's an exciting time. 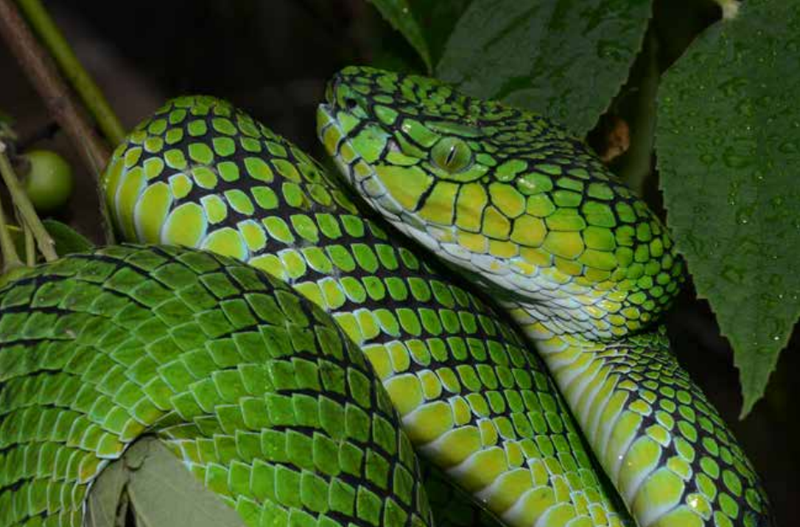 For a complete list of all 24 snake species eventually described in 2014, click here. Thanks to Peter Uetz at The Reptile Database for sharing with me some inside information, and to the authors of these papers for their photos. 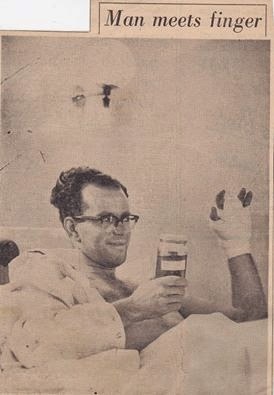 showing Broadley with his amputated finger. or listen to Broadley describe the experience here. Another fascinating post. Changing taxonomy plays havoc with people who try to keep a tally of the reptiles that they have encountered. I try to maintain a bird list and keep track of it all on, eBIRD. They drive me nuts by constantly informing me that I need to update my records to reflect changes in bird taxonomy. I do not even try to remember all the new names of old bird species. I have no idea what my real life list is. Thanks John! I agree, it is quite complicated. I use eBird as well, and I have to admit that I've found the way they handle taxonomy to be quite painless. I've heard that this is not the case on other bird life-listing websites, however.